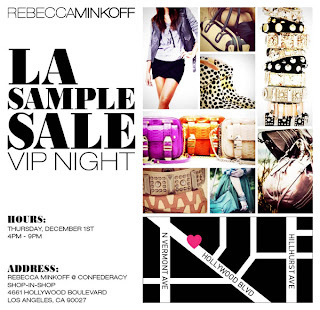 The Rebecca Minkoff bi-annual sample sale is coming up on in two California locations this week. There will be sales in both San Francisco and Los Angeles. Following are the details. Sat 12/3 11 a.m.- 4 p.m.
“V.I.P. Night” Thurs 12/1 4 p.m.- 9 p.m.
Fri 12/2 10 a.m.- 7 p.m. Sat 12/3 10 a.m.- 7 p.m.
Sun 12/4 11 a.m.- 6 p.m.